Home > Education > Classroom resources > Fifties Britain > Eden Must Go! The News Chronicle was a British daily newspaper which ceased publication in October 1960 being absorbed into the Daily Mail. This article forms part of a collection of material described by the Foreign Office as “samples of propaganda being put out by the Egyptians”. Twenty thousand people thronged Trafalgar Square yesterday afternoon at the biggest Labour sponsored rally ever held there. 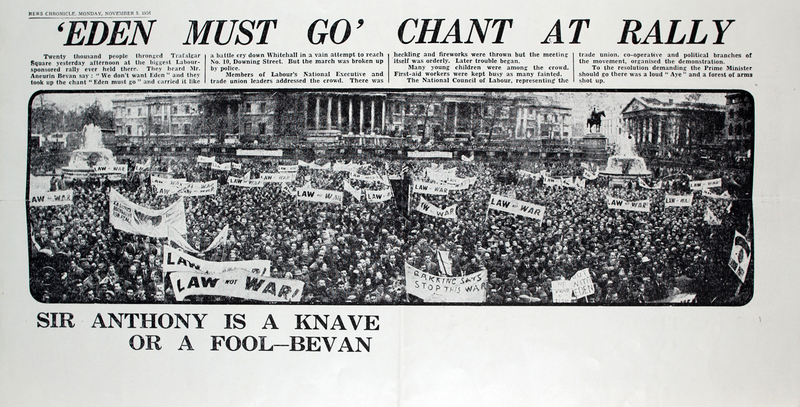 They heard Mr. Aneurin Bevan say: “We don’t want Eden” and they took up the chant: “Eden must go” and carried it like a battle cry down Whitehall in a vain attempt to reach No. 10 Downing Street. But the march was broken up by police. Members of Labour’s National Executive and trade union leaders addressed the crowd. There was heckling and fireworks were thrown but the meeting itself was orderly. Many young children were among the crowd. First-aid workers were kept busy as many fainted. The National Council of Labour, representing the trade union, co-operative and political branches of the movement organised the demonstration. To the resolution demanding the Prime Minister should go there was a loud “Aye” and a forest of arms shot up.